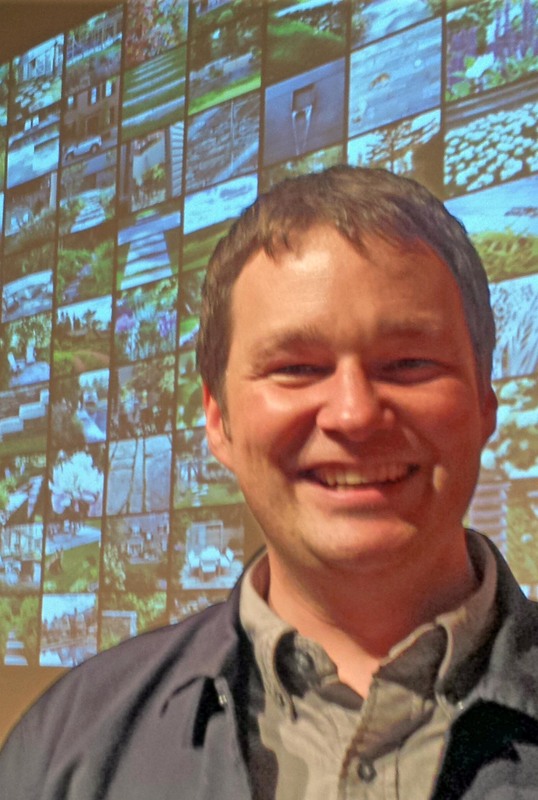 International award winning landscape architect Matthew Cunningham presented at Evenings with Experts, on April 4th. Co-sponsored by Grow Native Massachusetts and the Boston Society of Landscape Architects, his design bring a sense of nature to his clients’ homes, creating a sense of privacy and wildness through the use of hard-working, beautiful native plants. Last night, international award winning landscape architect Matthew Cunningham presented Revealing a Sense of Place at Grow Native Massachusetts’ Evenings with Experts talk at the Cambridge Public Library. The humble, approachable Matthew presented before-and-after profiles of several design projects he’s taken on, from a rocky, tide-swept cove in Maine to suburban West Newton and Brookline. In all cases, he borrowed concepts from nature, incorporating native plant communities into his designs, creating a sense of privacy and wildness for his clients. The most thrilling part for me was his satellite photo of Cambridge, MA pointing out his first client there. The next slide showed that the neighbors have caught on, and now his clients are dotted all over town, creating a growing quilt of properties that support wildlife and pollinators, manage and filter rain water, and provide numerous other ecosystem services that only native plants can provide…including services for clients who disdain tree huggers and care primarily for aesthetics. Keeping up with the Joneses now means people are investing in native plants, and it turns out that native plants don’t make a mess in your yard. They actually create a robust landscape system that hums on its own. This is the kind of news that inspires and delights me, and we could all use good news these days. This entry was posted in Cambridge MA, Cambridge Public Library, Design, Grow Native Massachusetts, Landscape architecture, Native Plants, Pollinators and tagged architecture, Brookline, Cambridge, design, landscape, Matthew Cunningham, Native, Newton, plants on April 5, 2018 by admin. 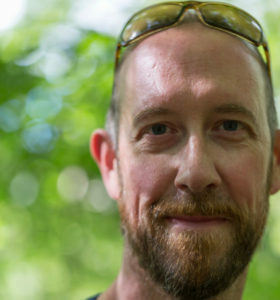 Uli Lorimer, Curator of the Native Flora Garden at Brooklyn Botanic Garden, will present Lessons Learned When Field Botany Meets Design at Grow Native Massachusetts’ Evenings with Experts lecture series at the Cambridge Public Library, Wednesday March 7 from 7:00 – 8:30 pm. Ecologically attuned designers are increasingly looking to nature for inspiration in the design of managed landscapes. But connecting field botany to horticulture is complex, and insights gained from observations in the wild don’t always translate directly into a cultivated garden. Uli will use the recently expanded native flora garden at Brooklyn Botanic Garden, a cultivated pine barrens and coastal plain grassland, as a case study— sharing lessons learned along the way as the project evolved from a concept into a dynamic, living landscape. Good design allows for change and succession to occur, and flexibility in design intent is a valuable strategy because things do not always work out as planned. Uli Lorimer has been the Curator of Native Flora at the Brooklyn Botanic Garden Garden for over a decade. He was instrumental in the expansion of the Garden’s native plant collection, using only material sourced from the wild and grown from seed. As Field Chair at BBG, he coordinates fieldwork with regional botanists and leads botanical expeditions for naturalists and horticulturists. This entry was posted in Botanic Gardens, Cambridge MA, Cambridge Public Library, Design, Grow Native Massachusetts, Horticulture, Native Plants and tagged botanic gardens, botany, design, garden, Grow Native Massachusetts, horticulture, landscape, Native plants on February 25, 2018 by admin. Eager to learn more about native plants? Join Grow Native Massachusetts‘ Evenings with Experts this winter! This free public lecture series is held at the Cambridge Public Library on the first Wednesday of each month, from February through May from 7:00 — 8:30 pm. On February 7, Dan Segal, owner of The Plantsmen Nursery, will present The Beautiful Adaptations of Native Plants: Inviting the Wild into our Gardens. Native plants have evolved a broad array of adaptations in the wild, yielding not only the ornamental features embraced in horticulture but many fascinating mechanisms for survival. Dan will take us beyond ‘pretty’ plant features to explore the origins of these adaptive traits, and the critical importance of regional variation. This insight helps us to select plants that are genuinely suited to our landscapes. He will also compare and contrast large-scale nursery production that favors the cloning of cultivars, with small-scale nursery propagation that favors seed-grown straight species. To know and source native plants effectively, understanding their propagation can be just as important as species selection. As the owner of The Plantsmen Nursery, Dan Segal specializes in native plants, local seed collection, and natural landscaping. Dan has collected and propagated over 1,000 species of native plants in his three decades of work as a nurseryman, giving him great insight into the fascinating variety of adaptations that plants have evolved to survive. His nursery is in Ithaca, NY, where founded the Ithaca Native Plant Symposium in 2009. This entry was posted in Cambridge Public Library, Garden events, Grow Native Massachusetts, Native Plants and tagged MA, Native plants on February 3, 2018 by admin. Shrubs to Prune in Late Winter – Which Ones and How?